A beautiful new favorite or should I say old-fashioned treat, an updated and fresh Ambrosia as my contribution to a wonderful Easter dinner. I recall tasting someone’s years ago and cringing at the sweetness, but this version was fantastic neither too sweet or tart given the amount of grapefruit called for in the recipe. I thought that I would add some fresh cored pineapple and after adding a few chunks and blending it in, I tasted a piece not as ripe as I would have like I finished with just the canned chunks…I guess the store was in a rush to make Easter tourists happy with fresh cored pineapple and didn’t pay attention to the ripeness:( lesson learned, taste the fresh before adding. It was too late to try to fish out the chunks, but not that much went into the mix. All in all a great recipe…I found the fruit in the cold produce section rather than in canned foods and of course if you would like to prepare fresh by all means try it, but what a lot of work! Chill a glass or metal bowl or the bowl for your stand mixer for at least several hours, add the heavy cream, sour cream, and sugar to the bowl, beat with an electric mixer or your stand mixer on medium speed until stiff peaks form. Gently fold the grapefruit, mandarin oranges, pineapple, cherries, apples, pecans, marshmallows, and coconut into the whipped cream mixture. 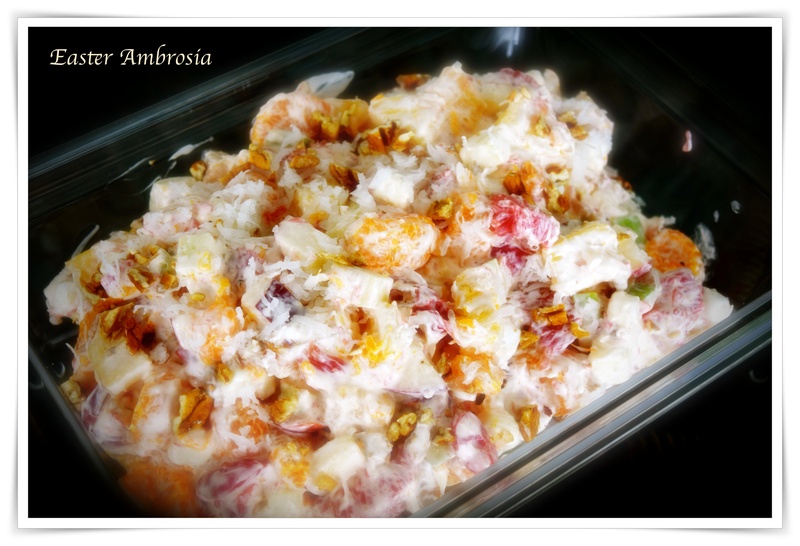 Cover and let the flavors of the ambrosia come together in the fridge for at least a couple of hours or overnight.